Last Thursday and Friday we celebrated Halloween at my school. Halloween is not a common holiday in Korea. Kids know what it is because of Western media and they learn about it in school, but they don’t trick-or-treat or celebrate Halloween outside of English class. This means that Korean children and North American children have very different perceptions of the holiday. When I was a kid there was always a build up to Halloween. It involved making Halloween crafts in school, agonizing over what the perfect costume would be, trying to convince my parents that we needed WAY more halloween candy than we really did, and picking out the perfect pumpkin. By the time October 31st finally arrived, the Halloween energy in the air was almost palpable. Sure, Halloween was about candy, but it was also about trick-or-treating: the one night of the year when kids are given the freedom to run around the neighborhood after dark, in crazy costumes, with their friends, on a school night. Candy is a very important part of Halloween – perhaps even the most important part for a lot of kids- but in North America it is not the only part. In Korea, however, where trick-or-treating does not exist, Halloween ought to be renamed END OF OCTOBER CANDY DAY!!!!! In caps, with five exclamation marks. On Thursday I had a three-hour period with three first graders (two boys and a girl.) This class is a long one on regular days, since three hours is a long time for beginners in a second language, especially for first-grade boys. This week, however, we didn’t even have the structure of regular classes; it was Halloween day. Since there are only three kids in the class and they are very low-level, we were not participating in the spelling bee-type activity that the rest of the classes were doing. Instead, I had planned several Halloween-themed activities. Throughout the class I gave candy as rewards, but before I handed out the candy I made the kids go outside, knock on the door and say “Trick or treat!” They got the hang of it pretty quickly. Pavlov would have been proud. There was one big rule though: No eating candy until the end of class. I’m no dummy; I wasn’t about to feed sugar to children and then try to contain them in a classroom. 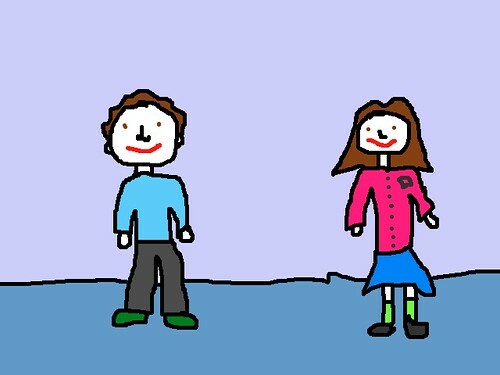 An artist's interpretation of two Thursday students, titled "Cute Kids, Right?" The grand finale of Thursday’s class was a pinata. I originally was going to make a pumpkin pinata, but I was unable to find orange poster paint. Instead, I wrapped the pinata in toilet paper, glued on a mouth and some googly eyes, and called it a mummy’s head. After I explained the concept of a pinata and the rules, I turned around to grab the plastic baseball bat the kids would be using to hit the pinata. In the split second that I had my back turned, I heard the very distinct crinkling of a candy wrapper. I whipped around to see one of the boys looking at me sheepishly. He had the same expression as my dog when I catch her steeling a loaf of bread off the counter. I didn’t want to be Teacher McGrumpypants at the end of an otherwise well-behaved party, so instead of punishing the student I allowed the other students to eat one piece of candy also. You know how in monster movies after the monster has its first taste of blood it will stop at nothing to get more blood? Well, that’s what this was like, only instead of blood, these little monsters were after sugar. All that stood between them and another hit of sugar were a few layers of paper mache and some googly eyes. In the end, I grabbed the mummy’s head and put him out of his misery by stabbing him with a pair of scissors. I let the kids tear him open and as soon as they had their bags of candy in hand they collapsed into their chairs, exhausted from a hard fifteen minutes of mummy-slaying. Looking back on the event, I think that I succeeded in introducing the kids to Halloween. I mean Halloween is about running around, being something you’re not for a short period, having fun with your friends, and sometimes things get a bit scary. These kids ran around as Mummy-hunters, had a ton of fun, and scared their teacher. So, mission accomplished, right? Love your Halloween story! 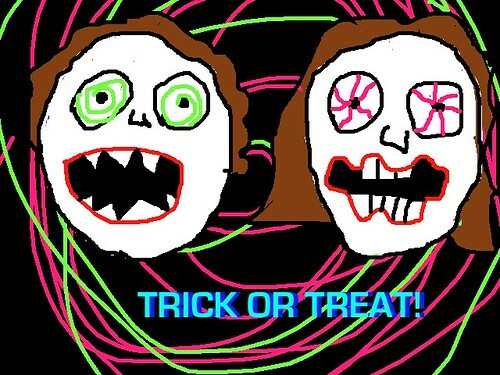 Your kids sound an awful lot like this: http://hyperboleandahalf.blogspot.com/2010/10/god-of-cake.html Glad you had a great Halloween! Ha! I guess I did the pictures as an homage to Hyperbole. As I was in class, I was totally thinking of that story!